If there are graves/urns on the lot, you may get ghosts. 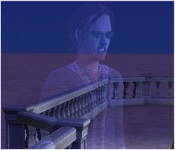 Ghosts that died of old age seems to show up less often. 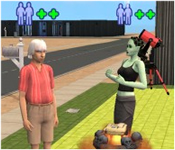 Depending on the state of the Sim upon death, they can be an angry ghost or just a randomly appearing ghost. Hautings happen at night and can move and turn on/off objects in the house. 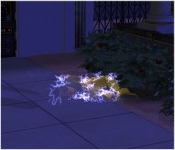 If your Sim is trying to sleep, the turning on/off of lights and opening/closing doors will wake them. 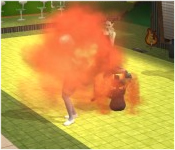 Ghosts can scare the piss out of Sims. 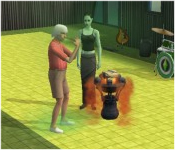 Elder sims run the risk of having a heart attack if a ghost scares them. 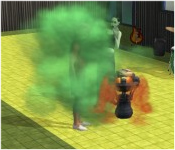 Some Sims love seeing ghosts while others hate it. There are a few vampires roaming around, mostly at the Crypt O'Night Club. You need to befriend one, either by hanging out them at night, or calling them at night once you've met them. Once you're at friend level or higher, invite them over (at night) and spend a lot of time with them. 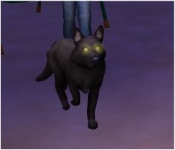 Eventually they will bite your sim, causing it to turn into a vampire. Vampire sims must have a proper bed and get to be before dawn or they will die. 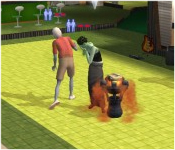 Careful when moving your vampire sims, as sometimes it moves them during the day, so you will need them to RUN for their bed. Once a vampire sim is depressed/starved or anything, it will be tough to get them to stay in bed. You can bring back the dead! If you don't pay the full $10,000 though, then you get a half-alive zombie. It lumbers around grunting and making generally zombish noises and thinking about brains. 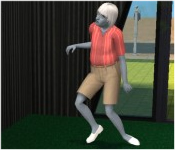 If you pay the full amount, your sim comes back without becoming a zombie. Apparently you can become a werewolf if you befriend a wolf and get it to bite you.